Describe yourself in 5 words. Hard working, tenacious, self-motivated, caring, pleasant. How long have you worked at SLPowers and what is your role? 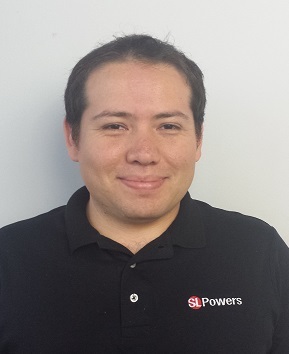 I’ve been with SLPowers for the past 10 months serving as a Project Engineer / GN Engineer. It’s been a fun ride, great people to work with, constant challenges, and an amazing atmosphere. What is your favorite aspect of working at SLPowers? The fact that our jobs make a substantial difference in our clients’ technologies which translates into greater efficiencies and productivity. If you had to eat the same thing for lunch, everyday, for the rest of your life, what would it be? I’d be OK with a subway sandwich. What is your favorite restaurant? Olive Garden, love the salad. If given a chance, who would you like to be for a day? Someone influential whose wisdom has the power to change the world in a day. What is your favorite line from a movie? “If you fall behind, run faster. Never give up, never surrender, and rise up against the odds.” This is actually a quote from Jesse Jackson, not Galaxy Quest as I originally thought. What is your personal mantra? “A journey of a thousand miles begins with a single step.” This is a quote from Confucius.